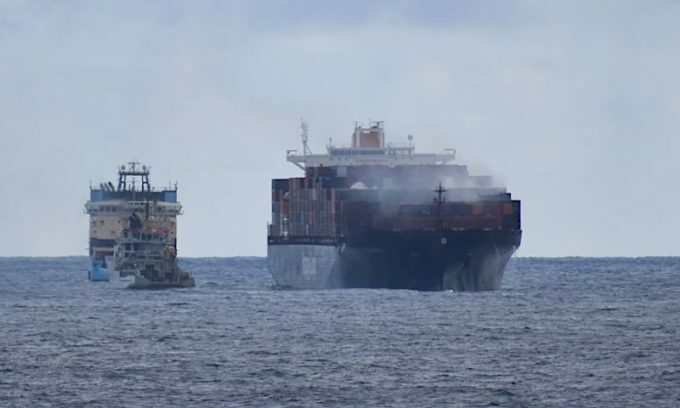 The fire-stricken 7,510 teu Yantian Express is expected to reach its port of refuge at Freeport in the Bahamas next week, but shippers with salvageable cargo on board should brace themselves for substantial costs and significant delays in obtaining their containers. Moreover, shippers that did not take out marine insurance, which one marine cargo insurer suggested to The Loadstar today could be half of them or more, and are unable to provide adjusters with acceptable security, could find their cargo auctioned. This is to recover the residual value of the cargo and the shippers may also be sued for costs and consequences. The vessel was on THE Alliance’s East Coast Loop 5 (EC5) service from South-east Asia to the east coast of North America via the Suez Canal was some 650 miles from the Canadian coast when the fire broke out in a container on deck and quickly spread. On 10 January, vessel owner Hapag-Lloyd advised that salvors had been “largely” successful in bringing the fire under control and, with five crew members back aboard, the ship was under tow at slow speed. Meanwhile, alliance partner Ocean Network Express (ONE) warned its customers that, based on the information it had available, to expect significant damage to cargo stowed in the forward sections. The carrier added that it expected that all cargo in Hold 2 (bay 11-17) would also have been affected by fire, smoke or firefighting water. ONE also said damage in adjacent areas was possible and that reefer containers in bays 1-24 had been without power. Hapag-Lloyd declared general average (GA) on 25 January and appointed UK-based Richards Hogg Lindley to determine and collect GA and salvage security from each of the parties concerned in cargo on board the ship. GA is a principle of maritime law where damages and salvage costs are shared among the cargo in proportion to its value. It could be many weeks before Richards Hogg Lindley is able to set the security amount required. In the case of the 15,262 teu Maersk Honam, which caught fire in the Arabian Sea on 6 March last year, the adjuster set the salvage security at 42.5% of the CIF (cost, insurance and freight) value of the cargo, with an additional 11.5% required as GA security. The 42.5% amount was to be held until the salvage remuneration was awarded, whereas the 11.5% will be held in suspense until the final GA adjustment has been completed, which is often several years later. The Maersk Honam casualty generated the largest GA loss on record, thought to be in excess of $100m. Shippers may also be required to pay the cost of the relay of their containers to their bill of lading destination – the ship was scheduled to call at Halifax, New York, Savannah, Jacksonville and Norfolk. In the example of the Maersk Honam, MSC told customers they must pay $750 per 20ft and $1,250 per 40ft to relay their salvaged containers from the port of refuge, Dubai, to their final destinations in the Mediterranean. MSC warned that failure to accept the cost would render cargo owners liable for storage and demurrage charges. So far Hapag-Lloyd, ONE and THE Alliance’s third partner, Yang Ming, have not commented on relay costs, which would constitute a commercial decision by each line. Poor show , the carrier was very light-hearted when reporting this casualty. owners to investigate if GA could have been avoided.